We're very excited to announce our inaugural publication, the Pearl Review coffee sheet! This is a monthly publication distributed in Powell River dedicated to literary news. 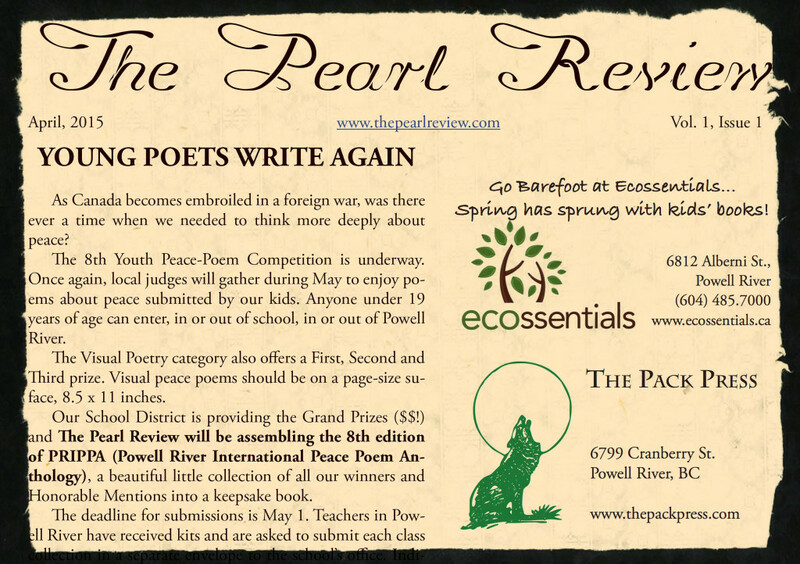 Our inaugural publication includes information on the Youth Peace-Poem Competition, news about forthcoming books from local authors, and a book review! To read the interactive, online version of the coffee sheet, click here or on the image below. To read the full coffee sheet, click on the image. The Pearl Review coffee sheet is made possible by contributions from our members. To learn more about becoming a member, please check out this page. We hope you enjoy the coffee sheet! Welcome to The Pearl Review! We're in the early days of this site, so at the moment there's very little on here. That will change soon -- stay tuned for reviews from our members, info on membership, how to get involved, pages on our books and authors, and much more.